When a fast-growing IT company wanted to improve their organic rank, we delivered an SEO campaign and here's what happened. A fast-growing IT company was keen to improve their organic rank for a range of keywords relating to their key service areas. Particularity interested in improving their visibility in local search results, the competitive nature of the clients industry meant that they were not ranking at number 1 for any of their primary search terms, and were within the top 5 for just 9. After defining the objectives of the project, we went on to carry out a thorough SEO audit, including competitor analysis and keyword analysis which helped us to determine the areas we needed to focus on. We then devised an initial 3 month plan which included a range of content marketing activities. Once the proposed activities were agreed, we started off by defining the most useful key performance indicators and took benchmark stats to allow for effective on-going comparison of results. We quickly took care of various verification processes, and set up our rank checking and monthly reporting mechanisms. META content and on-page copy was optimised, starting with the main service pages of the website and Analytics was reviewed to show us the most popular content pages, which we focused on initially. All of the above stats relate to activities that were carried out in a 1 month period, 18th August 2014 – 17th September 2014, compared to the 1 month period prior to activities starting of 18th July 2014 – 17th August 2014. We use sustainable, ethical SEO techniques that focus on providing your website visitors with high quality content. We also utilise local search tools to help you improve your organic search rank, helping you to attract more local customers. To discuss your SEO needs or for a free SEO audit of your website, get in touch with us here. 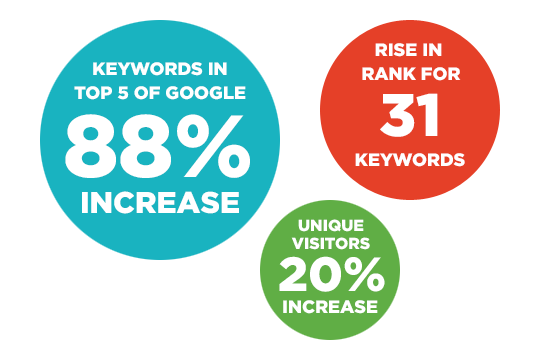 SEO Case Study: More Number 1 Ranked Keywords In Google Than Ever! Thanks to our commitment to creating quality content and a focus on local search, we produced SEO results this month that we couldn’t help but share! Find out how we got a prominent local legal firm to the top of Google in 6 months and the impact we made on their referral traffic.